This is a 1.950sq.ft. new construction, 2-story single family residence, located in a flag lot in Downtown San Jose. The main rooms are arranged in the ground floor, all at the same level for accessibility. Living room, dining room and kitchen all articulate in one fluent space. The first floor accommodates an office and a play/guest room, with relaxing views to the green roof. it has a remarkable number of green features, including an extensive living roof with xeriscaping, advanced framing system, a cool metal roofing, bamboo flooring and cabinets, double flushing toilets and the exterior walls boasts a fiber cement rain screen. The rotated geometric exterior maximizes the south orientation exposure, for passive heating and cooling. The double-height living space is flooded with daylight and cool breezes from the cross ventilation. You can follow the progress of the construction here. The project was an Eichler tract home from the 60’s, and it didn’t have any upgrade since then. The owner intention was to give it a fresher, more contemporary look but keeping its character. We did a complete upgrade of bathrooms and kitchens, replacing appliances and fixtures, electricity and plumbing, plus some interior decoration as new flooring and scheme colors for the walls. The materials selection was based in emphasizing the natural essence of them and in the property of bring more light to the different spaces. 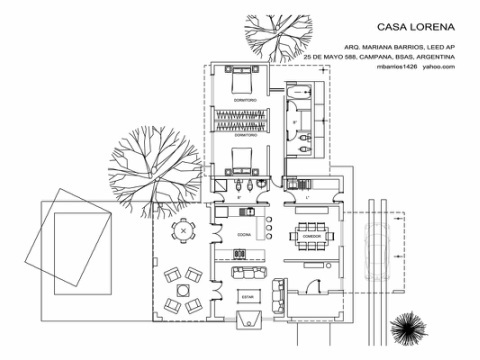 Casa Lorena is single family residence, new construction located in a rural area in Buenos Aires province, Argentina. It was developed in one level, where the public and private areas are well defined. Living room, dining room and kitchen flow boundless in one space, with visual integration to the outdoor patio and pool. Materials are traditional brick and mortar, with a corrugated zinc roof, referencing the traditional estancias construction in the pampas.